Yesterday was the first official day of fall and for once it actually felt like it! The temperatures didn't rise above 80, which for us is quite cool. Bianca and I took advantage of the lovely day by visiting one of her favorite parks. She happened to meet a little boy there and they became fast friends. After two and a half hours I had to peel her away from the park and her new friend. I often feel guilty for not giving her a sibling, so I justify that choice by letting her play with other kids her age as much as possible. I mean, so far it's worked out just fine! While the Delores dress from Unique Vintage is a fan favorite, it's the first one I've ever owned. I was really excited to try it! 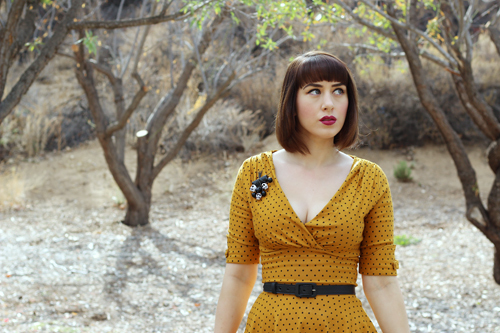 I can't help but fall for a dress with polka dots and a mustard colored background. It really embodies the fall season, which just so happens to be my favorite. The fabric is a stretch bengaline, which is perfect for hugging your curves. Since it has sleeves, it's important to have stretch fabric to not only accommodate your arms, but give you a full range of motion as well. I'm always saddened when I buy a dress and I can't lift my arms up. It's a total deal breaker! While this dress is a little too low cut for my comfort, it's nothing a safety pin can't fix. The skirt is quite full, but it doesn't need a petticoat. I usually wear an underskirt with full bodied styles but the Delores looked perfect on its own. I definitely understand why everyone loves this dress so much! I'm looking forward to a work-free weekend with my family. Our home is officially in escrow, so we're starting to get organized for this move. I seriously cannot wait. Our home is so perfect and beautiful, I can't wait to make it ours! If everything goes as planned, we will start this new chapter in our home in November. Fingers will remain crossed until our escrow closes!